Thassos has some of the best sandy beaches of any of the Greek islands, Golden beach is an extremely long stretch of gorgeous soft sand on the east coast with hundreds of umbrellas and sunbeds as well as dozens of beach bars and shops lining the rear of the beach and multiple water sports vendors. If you’re looking for the perfect tourist beach this is a superb choice. Alternatively, head to one of the other more low key beaches and relax away from the crowds. Whatever you’re looking for in a beach you are sure to find somewhere to suit your needs on Thassos and this guide will help you to find that perfect stretch of Aegean coast. Our Thassos beach guide was built to give you an overview of all the lovely beaches on Thassos. Each page will give you a description of that beach including the local amenities and a Google map of the location to help you find it. All you have to do is look at the map above, see what beaches are near where you plan to stay and then take a look at those beaches by clicking on the headings below. Alternatively, you can use the filters to narrow down the list of beaches to just those ones that suit your preferences. So if you just want to visit quiet secluded beaches whilst in Thassos then simply click the quiet button and it’ll remove all the popular beaches from the list. Agios Vasilios is a rugged stretch of coast line with sand, shingle and mainly pebbles under foot. It’s narrow with a shallow entrance to the sea. It’s probably not great for families as there’s not much sand for young children to play in and the lack of water sports or music would mean older kids would likely get bored too. Alexandra beach is well organised with 4 or 5 rows of sun loungers covering part of the beach as well as some luxury loungers available to hire. There’s a taverna on the beach to keep you fed and hydrated through out the day. There’s no water sports but there is a jetty with a platform at the end which is great fun to jump and dive off into the sea. The popularity of Aliki beach wont be to everyone’s tastes, in some places there are 4 rows of sun loungers, which, on a beach that’s just 15m deep means they are tightly packed in. What will be to everyone’s liking is the fantastic views of the bay, with soft sand, gorgeous turquoise waters and lush green trees lining the banks this is a stunning place. Astris beach is a decent size, roughly 260m long and 30m at it’s widest point so you should be able to find a bit of space for yourself, even though it’s pretty popular in the summer months. There’s mainly sand under foot but there are a few strips of stones in places and the sea bed is stony too, beach shoes might be a good idea when swimming. The rustic beach consists of soft, fine sand, a shallow entrance to the sea and some rocks around the edges. There’s no sunbeds, no taverna and definitely no music or water sports. It’s great for kids as they can play in the sand or paddle in the shallow waters. The only things to watch out for is the strips of stones around the entrance to the sea. Glyfada is a long but narrow semi private beach on the north coast of Thassos. Although not strictly private it’s pretty much only visited by those staying in the Glyfada hotel that’s right on the beach which means it remains fairly quiet throughout the year and if you are one of the guests at the hotel you’ll be able to make the most of the beach. Glyfoneri is a small picturesque beach surrounded by hills that are covered in pine trees, the trees offer shelter and shade for long periods of the day so it’s probably not ideal for sun worshippers but for those that prefer to keep cool it’s perfect. At just 50m wide Glyfoneri beach doesn’t have a lot of room but fortunately it doesn’t get too busy. Golden beach is one of the most popular on Thassos island, It’s just under 3km long so there’s plenty of room for everyone and it never feels over crowded. Golden Beach has a shallow entrance to the sea and soft fine sand making it perfect for families with young kids. There’s plenty to entertain older kids at Golden beach too. Kinira beach is located near the village of Kinira, just north of Paradise beach on the east coast. It is a narrow sandy beach with some pebbles and a shallow entrance to the sea so it’s good for letting young kids paddle in the shallow waters. San Antonio is a huge beach, it’s deep enough to have several rows of sunbeds and still have plenty of wide open space to simply lay out a towel or put your own umbrella up. Despite the fact that San Antonio beach is popular it never feels over crowded due to the vast size. Go to the Thassos resort guide to find out about the towns and villages on the island. Find something to keep you entertained with our Thassos sight seeing guide. Find information on another Greek island, whether that’s to hop from Thassos on a day trip or to research an alternative destination. If you’re going to Thassos or thinking about going then why not tell your friends about it using the links below? You never know what insights or advice they may have to offer. 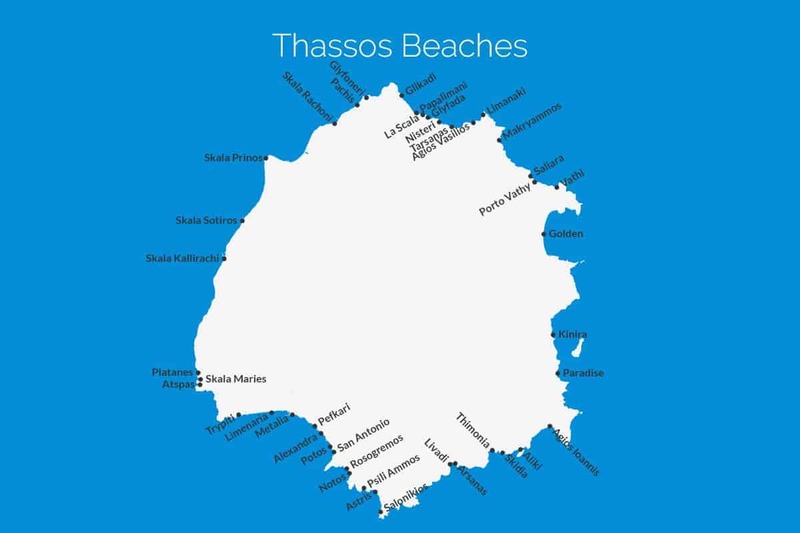 We want Which Greek Island to be as accurate and informative as possible, so, if you notice anything wrong with the Thassos beach guide or any other page please let us know. We’re also on the lookout for great photos to show people what the places we’re describing are like. If you have photos from any of the beaches in Thassos or from any of other island on the site then we’d love to see them, simply click the button below to go to the photo upload page. Thanks.